Angela has recently been described as "one of the hottest properties in the art market today". 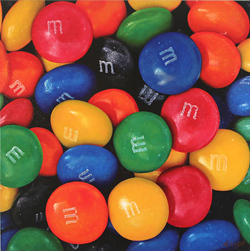 Her style is representative with a contemporary approach, using vibrant colours and a hyperrealist technique to create bold pieces full of intensity, narrative and emotion. Angela grew up in the North East of England, and now lives on the Sussex coast. Painting is her absolute passion, so rarely a day goes by when she cannot be found in her studio. 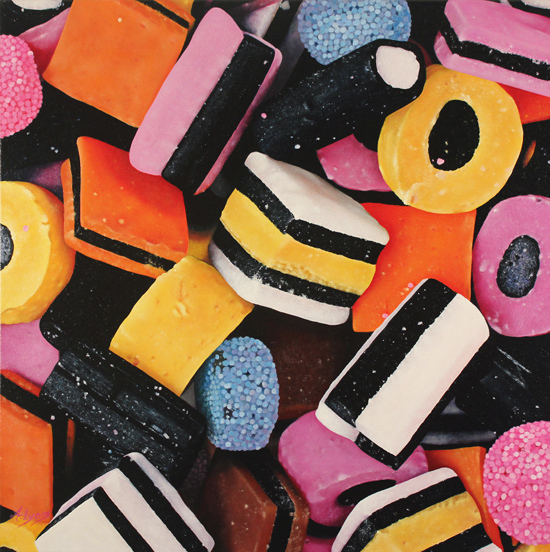 She works exclusively in oils on canvas, applying premeditated tones and sharp precision to each and every painting. Angela believes that it is often the simple things in life that make for the most pleasure. 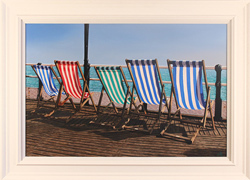 She enjoys capturing aspects of everyday life, from deckchairs on the beach to tempting, tasty treats. Her sweets and cakes in particular evoke childhood memories, spurring warm smiles of nostalgia. Angela’s paintings can be found in selected galleries across the country, and the universal attraction of her work has already gained her a number of avid collectors. A formidable force in the contemporary art scene, Angela has a remarkable ability to find and capture the beauty of daily life in extraordinary pieces of work. Her paintings are not only pleasing to the eye, but furthermore to the psyche, making them distinctive, treasured additions to any collection. Please note that all Angela Lyons art listed in this section has previously been displayed for sale and is not currently available.